Jack Quinn (Van Damme) is a retired CIA operative who wants to do nothing more than lounge by the pool with his wife Katherine (Lindinger), who happens to be pregnant, after a long career of CIA operations. However, trouble rears its head in the form of super-evil baddie Stavros (Rourke), a longtime enemy of Quinn’s. Stavros is so dangerous, Quinn must travel to Antwerp to meet Yaz (Rodman), a colorful, flamboyant arms dealer, to sell him the latest in hi-tech weaponry. After a shootout and one-on-one battle with Stavros, he ends up escaping once again, and Quinn is sent to a mysterious place called “The Colony” which is not at all based on The Prisoner TV show. Quinn spends most of his time at The Colony training and working on his escape plan. Once firmly out of the grasp of The Colony, he and Yaz team up to take one last shot at Stavros - who has kidnapped Katherine, and now his newborn son. Will Quinn and Yaz make the ultimate DOUBLE TEAM? 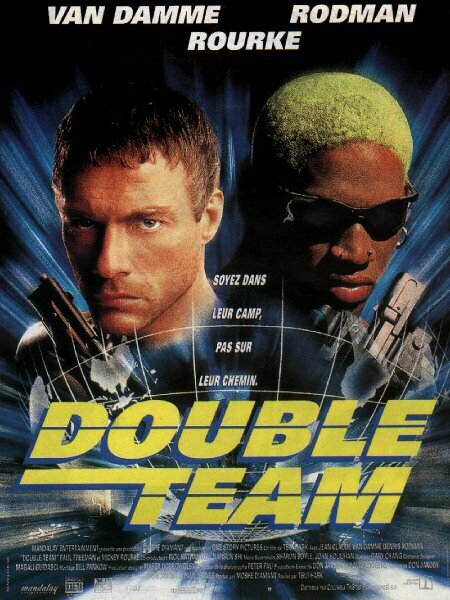 Double Team is classic 90’s Van Damme. The presence of Dennis Rodman cements the fact that it’s classic 90’s, period. This was not only an era in time when JCVD movies came to the theater, but when DENNIS RODMAN movies came to the theater. It truly was a more innocent time for us all. The fact is, Rodman’s outlandish female outfits, wacky hair, silly one-liners and, let’s face it, infectious charisma enliven the movie immeasurably. Director Tsui Hark brings that kinetic HK style and crazy camera angles he and his brethren are known for. Throw in some Mickey Rourke as the baddie and a tiger (during the climactic battle) and you have the enjoyable and entertaining movie we know and love today. During a big chunk of the movie, namely the “Prisoner” sequence, you might find yourself asking “where’s Yaz?” or “this movie could really use more Yaz”. 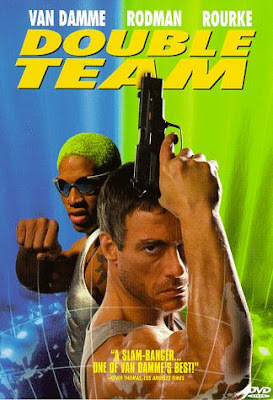 The fact is, Rodman and Van Damme do have very good chemistry together, and there’s certainly no shortage of basketball jokes and references in the movie. 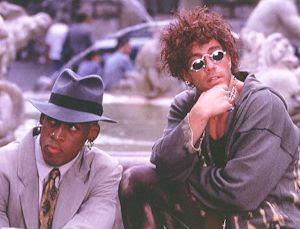 During the heyday of Rodman, he only appeared in two movies. This one and Simon Sez (1999). Fascinatingly, and inexplicably, both films feature “Cyber-Monks”. That is, underground monks using modern technology. A quick look on Urban Dictionary for Cyber Monk includes this excerpt: “They have a strange tendency to show up in high-tech espionage movies starring Dennis Rodman. Some are known to dance.” Whether they are in Rodman’s contract as a prerequisite to him being involved, we don’t know, but Cyber Monks are definitely a thing. And we don’t know why. Martial Artist and stuntman Xin Xin Xiong is also involved with both Rodman vehicles. Double Team definitely delivers what fans want: wild stunts, a classic training sequence (but with a twist: Van Damme’s time-honored split is done vertically this time, not simply horizontally as usual), at least one character walking away from an explosion in slow motion, and many characters who scream while shooting their machine guns. Because Hark is the director, there are certainly some odd close-ups and such, and there are many moments that are weirdly nonsensical, but it’s all part of the fun. Plus the movie mentions North Korea as a threat, which was pretty ahead of its time in 1997. Rodman knows you can never get enough Rodman, which is why he also appears on the closing credits song, “Just a Freak” by Crystal Waters featuring Dennis Rodman. Maybe that’s why his star burned brightly but quickly back in the 90’s. But at least we have Double Team as proof that he teamed up with Van Damme back in that heady time. And the results are everything you could ask for. More classic Van Dammage. A very underrated picture, which was slaughtered by the critics. Tsui Hark directed several classics, including the Once Upon A Time In China movies. Great review as usual. This was classic Van Damme...His chemistry with Rodman was great. This film and Knock Off are gloriously ridiculous films (if I had to pick a favourite I'd go with the exploding jeans of Knock Off). I wish Tsui Hark and Van Damme had done a few more but it was pretty clear mainstream audiences weren't digging them. Interesting that the film mentions North Korea as a threat. I don't think Rodman's best friend Kim Jong Un would be pleased about that! Can't agree more! (We're posting Knock Off this Friday too). Exploding jeans? Brilliant. If only audiences enjoyed the Van Damme-Hark team-ups, we've could've gotten more! Kim Jong Un must love this movie and that's why he's best friends with Rodman. Haha.